For easy control in a pond, we recommend using our POND Solution products. Dibrox® Herbicide is one our our POND products and will easily take care of excess Sago Pondweed growth. Also, the systematic herbicide Fluridone can be used. It will be absorbed by the sago pondweed over an extended period of time. For lake shores, we recommend using our Dock and Swim Area products. Dibrox® Herbicide is a great choice for eliminating areas of undesired Sago Pondweed growth. This Herbicide is a fast-acting contact herbicide that will quickly eliminate Sago Pondweed. Sago Pondweed typically grows in clumps in shallower water, often times making its way into areas that would otherwise be perfect for swimming. To restore these areas back to recreational areas, we recommend treating for the plants. Sago Pondweed is a very common species of submersed plant that is found in both lakes and ponds. It’s usually found in depths of 1-2 meters and is a bottom-rooting species. It can grow in a variety of sediments and water conditions. 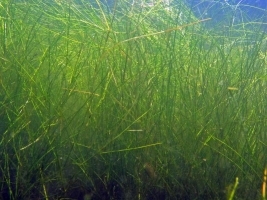 When viewed from the surface of the water, Sago Pondweed can resemble long strands of grass growing up from the bottom. Its leaves are 3-10 cm long and .5-1.5 mm wide. The plant’s flowers and fruit are produced on a slender stalk (3-10 cm long) that may be submersed or floating on the water surface. The flowers and fruit are arranged in small whorls that are slightly spaced apart on the stalk (creating the appearance of beads on a string).